He has come a long way both literally and figuratively from his days as a poor shepherd boy in North Africa, but Ben Amor is a symbol of what can happen when someone's American Dream comes true. The successful career man reinvented himself again after a dream in 1983 of children crying because they were dying of starvation. Unable to forget the sound, he founded Terra-Genesis Inc., a nonprofit agency that began as a way to try to end world hunger through technology. I have been reading some memoirs and autobiographies for my blog. I do notice that it's hard for me to finish these books and get totally involved. Maybe this just isn't my genre. It's also very hard for me to rate these books, because you're actually rating someone's life. It's kinda weird for me. This book was very inspirational and the positive voice Ben Amor is having, is a great part in this book, since I try to be positive in life and "delete" the negatives, I highly enjoyed this part. Inspirational: One of the greatest parts in this book, is that it's very inspirational. For people who struggle to see the positive things in life, people who have dreams but find it hard to achieve them, people who want to know what can happen by believing in yourself, your dreams and your positive voice. But also for teachers like me, who deal with criticism all day, all week, all year, mainly your own critical voice towards yourself. I found it very inspirational to read the life lessons and to maybe see things in a different perspective. Quotes: I loved the beautiful quotes. I could apply them to my working life, since I sometimes struggle to see the positives and to be positive about myself as a teacher. I could see myself using the quotes in a presentation or just take this book out and read some of them to reassure myself. Wanted to know more: A very big part is about Terra Genesis and Ben Amors role in the whole process, but I was also very curious about Ben Amor outside his working life. I did get some glimpses, about his family and his wife and son and family in Tunisia, but I was just curious about the things he does for relaxation, where he spends his weekends, what nice things he does with his wife, and so on. Slow read: I found this a very slow read. I read it chapter by chapter and had to put it away for a while after finishing a chapter. I was very inspired, but some parts were just very factual and not that much fun for me to read. I was determined to finish the book and I have to tell you that I found the Afterword the most entertaining part to read, where Ben Amor is really talking about everything instead of giving just the facts. I don't know if I'm making sense or if I'm explaining this the right way, I just had a hard time getting through. Not my genre? So now you ask me; Why did you read this book and say Yes for a review?! I have been struggling before with memoirs, I even DNF-ed one and didn't even write a review because I had no idea what it was about. I have been declining a lot of memoirs lately, because maybe this just isn't really my cup of tea. I can imagine people who like this genre, to give this book maybe 4 or 5 apples. Very inspirational, a lot of great quotes, a book that anyone can apply to a situation in their lives. A lovely narrator, such a positive person, this Ben Amor. Just a bit hard to get through if this isn't really your genre. "This is a wonderful, warm inspiring story that shows you that your dreams can come true." "Part history lesson, part tale of the American Dream, part self-help mixed with a generous helping of very-American motivational quotes. 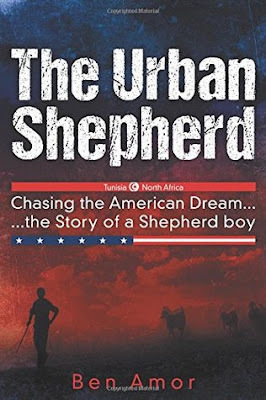 Urban Shepherd is sure to inspire." "I highly recommend reading Ben Amor's story. His journey is fascinating, inspiring and heartwarming. It focuses on the importance of having a dream and the courage and determination to chase it and make it a reality." "Life, I believe, is not about always doing the right thing or never having problems but about learning and about finding ways to fix problems that come your way." "... life is not about not making mistakes but about learning from your mistakes."